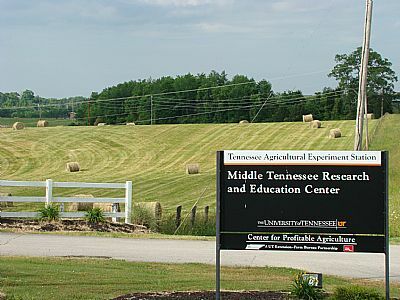 Established in 1917, the Middle Tennessee Research & Education Center includes 1,263 acres. The center is the site of research studies in beef and dairy cattle, commercial crops, fruit trees and forage crops. The center conducts research to evaluate varieties of commercial crops, management systems and weed control systems to improve crop production efficiency. Work is also underway on the production and management of fruit and vegetable crops, including peaches, apples, grapes, and blueberries. The grounds of the Middle Tennessee Research & Education Center The Center for Profitable Agriculture is located on the grounds of the Middle Tennessee Research & Education Center in Spring Hill. While the activities of the Center are primarily Agricultural Extension Service programs, the Middle Tennessee Research & Education Center provides a great environment and location for the Center for Profitable Agriculture's headquarters. The Center for Profitable Agriculture's faculty and staff members share the Research & Education Center's main office building, and work closely with the center's director, Kevin Thompson, and administrative specialist, Cyndi Petty. "UT experts talk about the danger of nitrate toxicity and how you can prevent it on your farm." "It's a problem for Tennessee farmers who produce our top commodity -- beef cattle. Insects such as flies..."
"UT Ag Researchers are studying what could be a compromise between food and fuel." "Weeds are a nuisance to gardeners, but downright devastating to those who farm for a living. But now experts..."